Veggies and vegans: look away now because things are about to get meaty. In case you hadn't heard, Blacklock is spreading to Shoreditch, joining successful sites in Soho and the City. 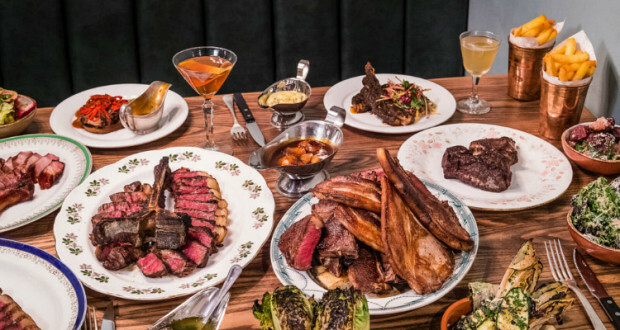 Set in a former Victorian warehouse, the 95-cover restaurant will be serving up the same high-quality grass-fed chops, flame-grilled steaks and whisky-based cocktails that made the brand a staple of all carnivores' diets. If you ever found yourself clawing to get a spot on the Soho branch's exclusive Sunday roast waiting list, you'll be happy to know that the award-winning feast will now be available at the new site. For the first time ever, you'll also get to sip on drinks in a dedicated bar area, which will feature a separate menu with dishes like Welsh rarebit nuggets and lamb scratchings. If that wasn't enough to get your mouth watering, then the bespoke drinks list should do it. Curated in conjunction with acclaimed New York cocktail bar Slowly Shirley, you'll find reimagined classics served from a special trolley and cocktails for a fiver alongside draught beers and wines on tap. If you aren't full just reading this, then save room for the signature cheesecake.